The biggest annual coin show in the Pacific Northwest, sponsored by the Pacific Northwest Numismatic Association (PNNA) and now in its 12th year in Tukwila, was once again a big success, with strong attendance especially on Friday and Saturday. Total three-day attendance, although slightly less than in 2011 due to nice weather, was estimated at well over 1,000. See the convention program with dealer list (PDF file). Juniors on the bourse floor were excited to have the opportunity to complete a set of numismatic items as part of the Young Numismatist (YN) "Treasure Hunt" game. Participation was excellent as always, and new PNNA board member Jesse Torres did an excellent job filling in for ANA VP Walt Ostromecki, who was unable to attend due to the ANA's Executive Director selection process. Boy and Girl Scout workshops were conducted on Saturday by James and Katie Reinders. Although attendance was low for the girls, those who did attend reported a successful program. See the 3rd Quarter 2012 issue of The Nor'wester for board and general membership meeting minutes. Special thanks to Mike Labosier for serving as general chairman for the 2012 convention. Revised! 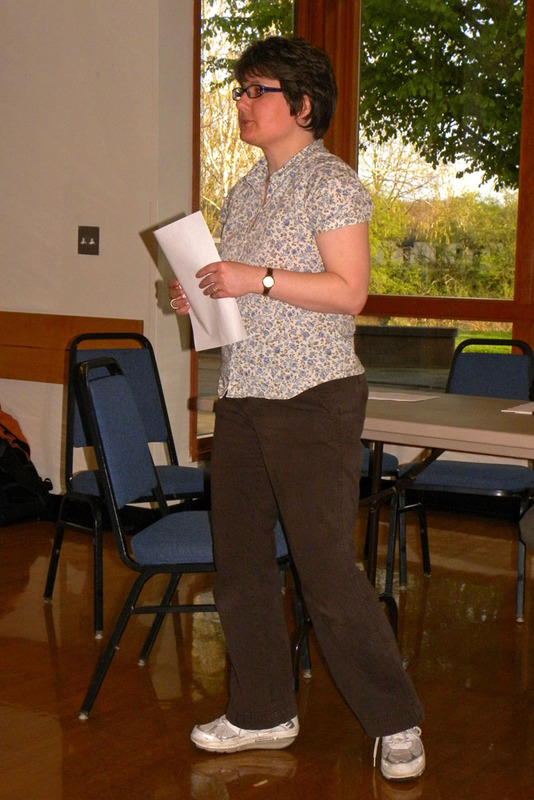 The PNNA is pleased to announce that the association's annual convention will again be held at the Tukwila Community Center, April 12-14, 2013. Outgoing PNNA President Lisa Loos opens the general membership meeting on Saturday evening, which was Lisa's last official meeting as president. 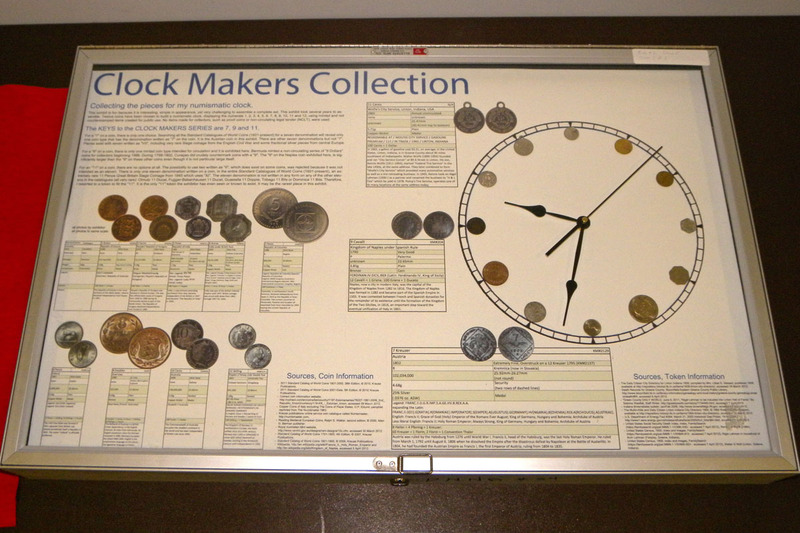 James Reinders won "Best of Show" for his exhibit Clock Makers Collection. Lisa Loos (left), outgoing PNNA President (see above) also received the Bob Everett Memorial Award from award committee chairman Danny Bisgaard (right). 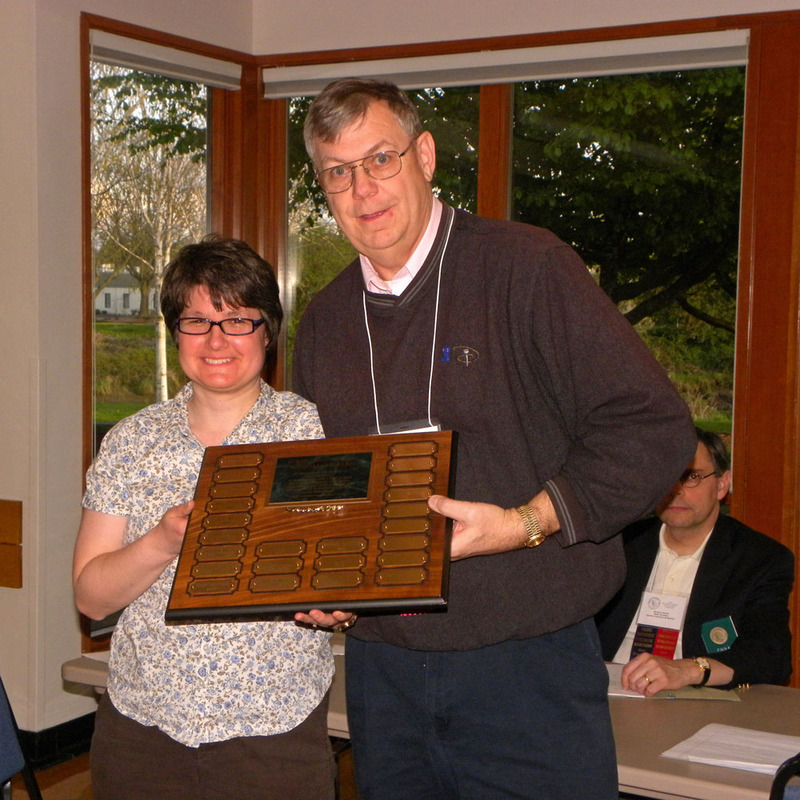 Gene Wiley (right), active and creative president of the Willamette Coin Club in Portland, received the Nina Nystrom Memorial Goodwill Ambassador Award from outgoing PNNA President Lisa Loos (left). This year's keynote speaker was Heidi Wastweet, who gave "A Behind the Scenes Look of a Coin Maker and Member of the Citizens Coinage Advisory Committee (CCAC) For the U.S. Mint." 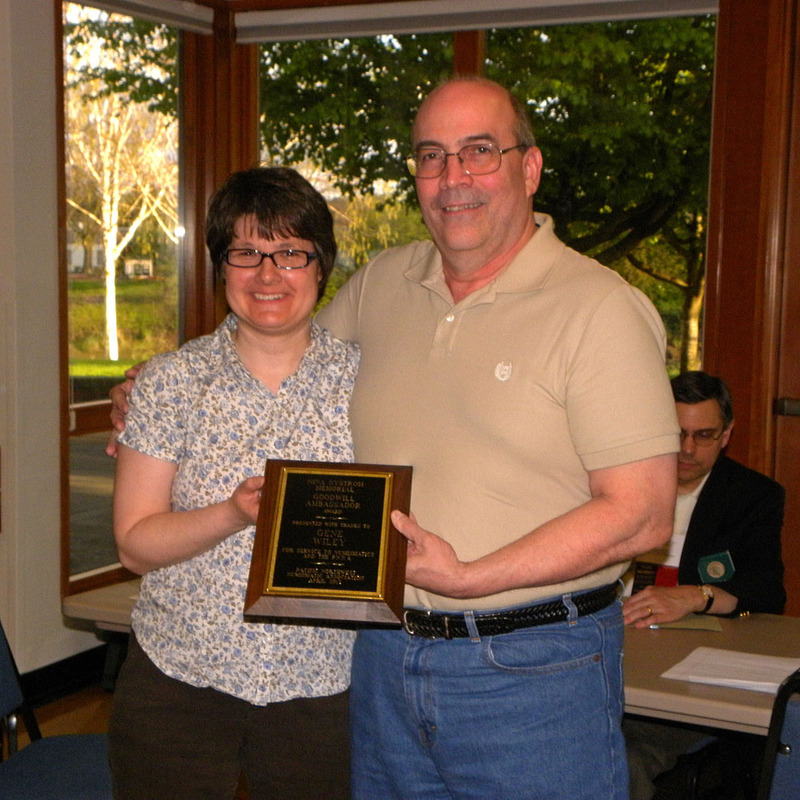 Gawain O'Connor, member of the PNNA's education committee, served as numismatic theater coordinator again this year. 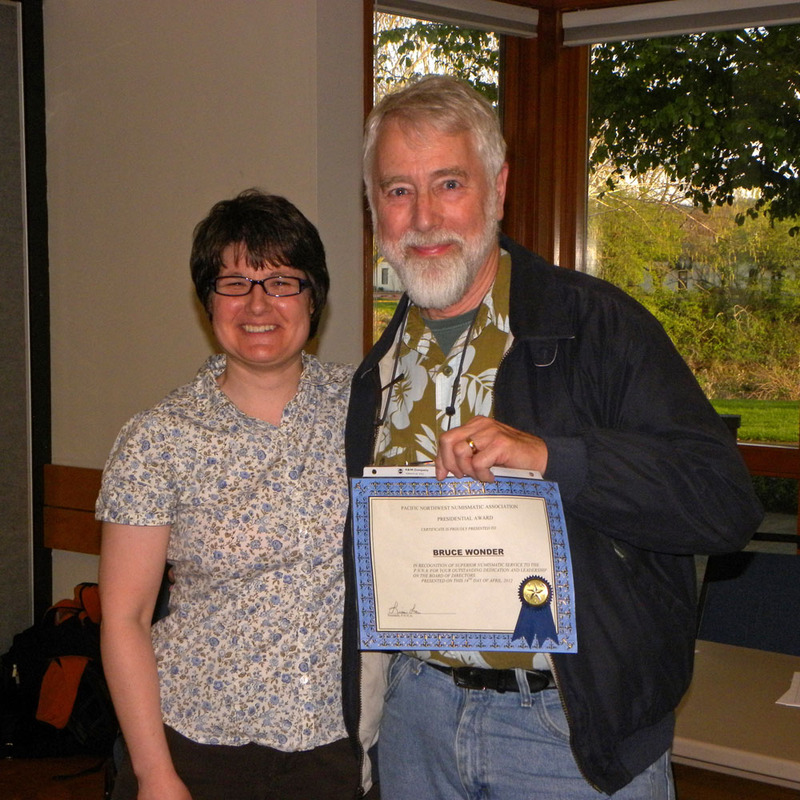 Lisa Loos (left) gives a PNNA Presidential Award to Bruce Wonder (right). Bruce is an outgoing member of the PNNA Board of Directors, and has served the PNNA and the numismatic community for many years. 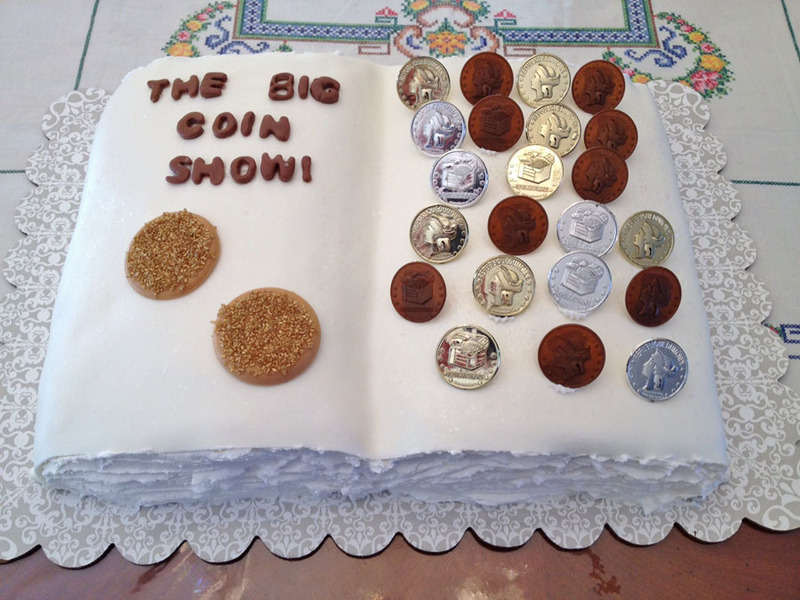 Photo: Cake for "The Big Coin Show" prepared by Juanita Labosier, wife of show general chairman Mike Labosier.